Last week, The AP took an unusually strict position against quotation of its work, sending a letter to the Drudge Retort asking it to remove seven items that contained quotations from AP articles ranging from 39 to 79 words. On Saturday, The AP retreated. Jim Kennedy, vice president and strategy director of The AP, said in an interview that the news organization had decided that its letter to the Drudge Retort was "heavy-handed" and that The AP was going to rethink its policies toward bloggers. "We are not trying to sue bloggers," Mr. Kennedy said. "That would be the rough equivalent of suing grandma and the kids for stealing music." Although that's not the end of the story -- AP has not withdrawn the takedowns -- Kennedy's comments are one reason I'm guardedly optimistic about the outcome. As I was grappling with what to do about this situation, I got some great advice from my fellow liberal blogger Liza Sabater of Culture Kitchen: "This is, by the way, a moment when every blogger ought to know immediately who to contact: Robert Cox of Media Bloggers Association." Cox's 1,000-member organization is like a blogger's ACLU, ensuring that the civil liberties issues inherent in blogging are staunchily defended from laws and litigation that could imperil online expression. In 2006, the group stood up for a Maine blogger, Lance Dutson, who was sued for criticizing an ad agency employed by the state's board of tourism. The agency dropped the suit within days after furious criticism from blogs sparked significant media coverage. For his story, Hansell asked me whether I'd like to duke this out in court with AP. The answer is, of course, hell no. 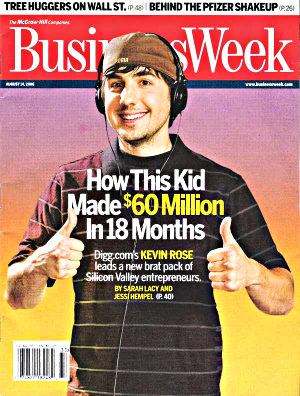 I'd rather they sued Kevin Rose of Digg, photographers dogging his steps into Manhattan federal court as he styles in an impeccably tailored suit chosen by his attorneys. The Retort's a hobby that got out of hand, a social news site that receives slightly less traffic than Digg. But I'm not willing to avoid litigation by capitulating on an important principle: The link-and-excerpt culture we've established in blogging is the way that millions of people find, evaluate and understand the news. Short excerpts should constitute fair use, as long as the excerpts are brief and links are provided to the complete work. When AP meets with the Media Bloggers Association this week, the titan of old media has an opportunity to set precedent by embracing the way that new media share its stories. As a former newspaper journalist and proud J-school graduate, I'm living in a dream world where A.J. Liebling's cynical lament, "Freedom of the press is guaranteed only to those who own one," has been rendered obsolete by a medium in which the price of a press dropped to zero. I'd hate to see that disappear in a cloud of murky copyright litigation. Bloggers and social news site users will embrace media organizations that encourage them to link, share and excerpt their news articles. IANAL ... the last time I got overheated about "fair use" I learned that it is NOT a right. It is a legal defense. Which means they can ask you to take down the offending text and sue you if you don't comply. You can then use "fair use" as a defense in the suit and MAY win (or escape damages). As you say. Copies have a cost approaching zero for most media. Controlling copies as a business strategy is doomed to failure ... how many fingers does it take to fix a broken dike? You get drowned in the flood. The AP will suffer huge looses in "good will" with this campaign to try to control their words to this degree. They would be better served by trying to get the copied text to link back to their internet properties and benefit from the attention generated as a result of being a source. Train the borrowers to respect the source and demand links back to AP properties. Manage the AP properties for revenue generating potential. Don't send attention away from your properties ... that's like the NY Times first attempt to create value from their Web content: $59/year? and few takers. Now, they are open and generating huge revenues from ads ... duh. AP needs an "advertising" strategy ... and fast. Before they trash their brand so severely that consumers reject anything with their brand attached. PS> Rogers Cadenhead could use some help with a "fair use" defense if he stands his ground for changing the game in the courts. As a small business owner it's likely he'll let someone much bigger take on the case. Mike Arrington is a lawyer and he's taking the "boycott" route ... and his properties have a lot more revenue than Cadenhead's. Court is almost always a waste for the small business owner ... avoid it when possible. Lawyers are professionals that bill their time at very high rates and courts are still in "beta" in terms of efficiency and quality of results. Hahahahaha.....Hilarious, you were able to parlay this 'setbck' into a New York Times article....Damn fine marketing effort. Now tell the truth, who is your inside person at the AP? Just a quick FYI: the Washington Post has blacklisted AP stories in response to this. Ouchie. Michael Donnelly says: "the Washington Post has blacklisted AP stories in response to this". No, they've republished Michael Arrington's blog post on Techcrunch. Fair Use was intended to allow a critical reviewer to embed segments of copy protected works in a review. The nature of "Drudge Retort" does NOT meet this criteria. It embeds text from AP without any surrounding critical analysis. As such it does not meet the intent of Fair Use, IMHO. Of course, I would like to see the law modified to allow quotations for copy protected works in all fields: text, music, photography and video. This would enable the individual to create mashups, collages, new mixes and documentary video using the new personal digital creative desktop and on-line tools (blogs, downloads, podcasts, etc). One can only hope that we see such a shift in the next few years. Make art legal. Should linking and embedding news be legal too? Picasso's Guernica use of segments of a a newspaper. any number of "Variations on a Theme by (someone else)"
any song that sounds like Chuck Berry wrote it: "Back in the USSR"
Imitation is the sincerest form of plagarism? Larry Lessig on the SCOTUS, please. The nature of "Drudge Retort" does NOT meet this criteria. It embeds text from AP without any surrounding critical analysis. Many bloggers on the Retort do post criticism along with the link, reword the text rather than excerpting verbatim, and make other judgments like using a quote from the article instead of the lead paragraph. The discussion that accompanies each link, which usually includes comments by the user who shared it, contains analysis and criticism of the story. This structure is common to many social news sites and ought to be considered fair use, in my opinion. Seems like just posting a story, part of story, or link these days implies some sort of comment, and that Fair Use law was written for a different medium. I love that I read the latest update to a story about the AP being mad at Rogers about something in the Drudge Retort (apparently a meeting of AP persons and "bloggers" to discuss the number and nature of their future fair use hissy fits is in the works) in an AP story I found on the Drudge Report. What you describe does sound like Fair Use. The instances that they requested you take down probably do not meet this test. Do they in your estimation? You don't have to answer that. How does Google handle AP references... they quote any page they point to don't they? Is their use of links with embedded text different from your "infringing" citations. It would be so nice if the courts weren't in the pockets of major media. Actually there are probably three branches of government that have been influenced against benefitting the common man. "The Medium is the Government." (with apologies to Marshall McLuhan). Rogers have you thought about contacting some of the others that are involved in current fights with the AP.. it seems to me there may be some overlap and that some sort of mutual fight (I don't know if class-action is the appropriate term) would be in order. "We are not trying to sue bloggers," said Jim Kennedy, AP vice president and strategy director. "That would be the rough equivalent of suing grandma and the kids for stealing music." If AP still sees "Fair Use" as theft, all that's being reconsidered is the news agency's perceived right to prosecute at this particular time -- not our right to excerpt the disputed material. Given that mindset, AP prettying up its internal policies won't protect bloggers. Without court clarification of Fair Use Rights, grass-roots media may ultimately be silenced by frivolous copyright infringement litigation -- or even the mere threat of it. That's a threat against Democracy, in an age when the Internet remains the last viable medium for uncensored news. this fair usage 'thing' is very ambiguous to me as the 'big sharks' can twist as and when it suits them.